From Manly's beaches to bays, there are plenty of things to do in Manly. While the locals love the cosmopolitan dining and shopping, it is Manly's natural beauty that attracted them in the first place. 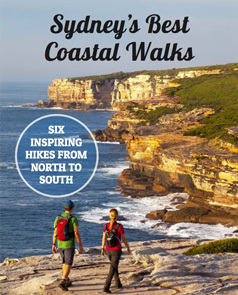 So pull on your boots and follow our guide of things to do in Manly for people who love the outdoors. This post contains affiliate links, meaning if you purchase something from our link we may receive a small commission at no cost to yourself. Thanks in advance for your support – it helps us provide this information for you. To discover the ocean side of the peninsula and the famous surf beach, from Manly wharf cross the road near the information centre. Walk down the pedestrian-only The Corso rather than taking Belgrave Street. It’s the most direct route – a five minute walk – between the pier and beach. You’ll come out at Hotel Steyne, opposite Manly Beach. If you have more time to explore (another fifteen minutes each way), then turn right to stroll along the coastline to the lovely Cabbage Tree Bay and Shelly Beach. Unless planning a walk around North Head, return the same way via The Corso to the wharf. There is seriously no better way to get to Manly than by ferry. The iconic Manly ferry departs Circular Quay in the centre of Sydney, cruising past scenic views of the harbour, magnificent homes and protected pockets of national park. It’s a delightful 30 minute ferry ride across the harbour to Circular Quay (Opal cards valid on public ferries). Or 20 minutes if you pay slightly more for the privately operated Manly Fast Ferry (Opal cards are not valid on this service). Sit on the starboard (right) side of the ferry for views of the walking route, Middle Head and Taronga Zoo, or port (left) for views of North and South Heads and the eastern suburbs. For detailed public transport information from your specific location, check Transport NSW. When you're looking or things to do in Manly, it's hard to find free or even low-cost all-day parking. There's a privately run carpark at Manly Wharf. It can be expensive – $59 for more than three hours – so take advantage of “Early Bird Parking” on weekdays only. This will cost $35 ($25 to book ahead online), as long as you arrive between 7:00am – 9:30am and leave between 4:00pm – 7:00pm. There’s another Secure Parking at 25 Darley Road, maximum $30 weekdays and weekends. See details for both private carparks at Manly. The four council-run car parks are free for the first two hours but can be up to $41 for the full day. Those car parks are in Central Avenue, Whistler Street and Wentworth Street, Manly. Check Northern Beaches Council carpark information. Staying at Manly is the ideal Sydney beach experience. A few hotels – Novotel Manly Pacific (55 North Steyne, near the ferry) and The Sebel Manly Beach (8-13 South Steyne, near the ocean) – give way to holiday apartments, B&Bs and hostels. Of special mention is Q Station (1 North Head Scenic Drive), meticulously converted from the original Quarantine Station. Situated in Sydney Harbour National Park, it has harbour views, its own sandy beach, good food and a feeling of getting away from it all. Check all Manly accommodation availability and prices. Tagged Manly, Northern Beaches Walks, Spit to Manly, Sydney Harbour National Park.